I am trying to automate video conversion process using Automator and Handbrake CLI version. I am trying to implement the functionality that whenever a video is downloaded in my dropbox folder on my PC it is converted and put in another folder. Currently i am testing it with a test folder (not on dropbox so i am just copying files to it to test). When a put a single file or multiple files in the folder simultaneously it works. But when i put one file (or many) and script is executing i.e. converting the videos and i put another file in the folder then for that new file script is never called so the new video is not converted. So how can i achieve this functionality that when script is running and new file is added another instance of script is started for new file. Ideally, your script needs to complete as quickly as possible. The easiest way is to spin off the processing of the movies into background processes. You can do this by adding a space and an ampersand & to the end of your HandBrakeCLI line. However, this does not solve the problem of new files being ignored. In fact, your files could now be processed twice if the processing is not finished before the next new file appears. Your script should move each new file to another unmonitored folder before processing begins. Consider adding a mv command before your HandBrakeCLI line. Alternatively, you could have Automator perform the move. The destination folder should ideally be on the same drive, so it completes quickly and does not delay the script. I highly recommend Don Melton's (former Apple Safari chief) transcode-video script for converting video files. The topic and script are covered in depth on iMore's Vector podcast, episode 22. To automate, the script could be wrapped in a Folder Action, or see Don's Gist comment (24 Jun) on how he does batch transcodes. Also keep in mind that there was/is HandBreakeBatch which like the name indicates is meant to do batch processing HandBreak. Habdbreak now should Support Batch processing by them selfes. Not the answer you're looking for? Browse other questions tagged applescript automator . Why does this bash script not work as an automator service? 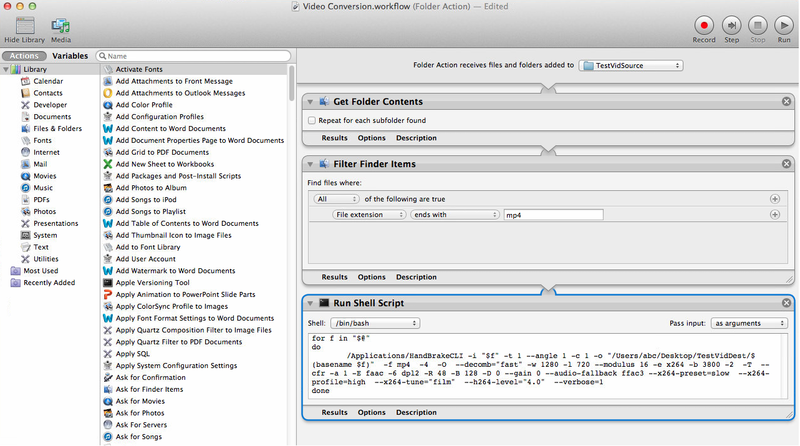 Automator: Select only one file out of many files in a folder. Script needed?